Your goal in Monkey Duel is to accumulate points by jumping monkeys from one bamboo stem to another. Monkeys that reach the opponent's side of the board score points. Hitting opposing monkeys off the game board also scores points. Players take turns rolling and exchanging dice to bring new monkeys to the board, move their monkeys or throw coconuts at opposing monkeys. Monkeys move in two ways, either by climbing directly onto their current bamboo rod, or by jumping to the next one by descending from one or more spaces in the process. 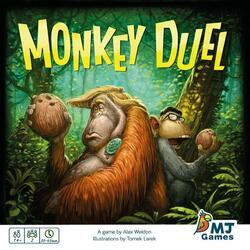 Monkey Duel is a positioning and timing game. Monkeys placed higher on bamboo stems have an offensive advantage, but each movement requires you to give up altitude. Monkeys can also protect each other, so deciding when to stick together and when to take an individual break is the key to victory. Monkey Duel is being funded on the Crowdfunding Kickstarter (See the campaign) platform until the 27 April 2019. 12 people are currently participating in the financing of the game, whose the amount requested is CA$25,000.00. Thanks to these 12 people the campaign is already funded up to CA$547.29, ~2.19%.